Soulace offers a variety of ongoing classes, special workshops and events in flow arts, dance, yoga and other movement art. To view the most up-to-date information on these happening visit our Facebook page. 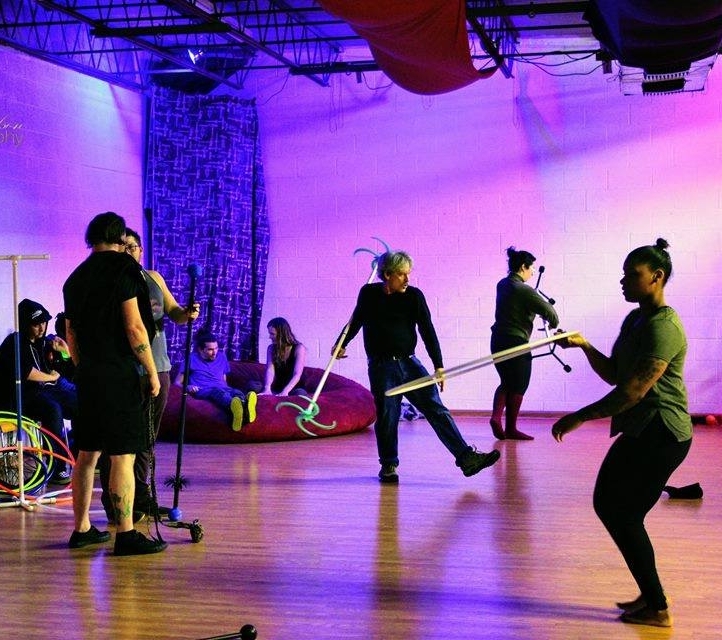 Nashville's Second Saturday Flow Jam has been bringing flow artists of all walks together for over 3 years now. When Soulace opened, we gave the jam a rent free home. Every month, *usually* (though not always, be sure to check the calendar!) on the second Saturday, we get together in a large space with mirrors and music. We catch up with friends, skill share, dance, hang out, and of course, spin all the things. Often we have live music, though if there is not live music we jam to guest playlists, which has it's own appeal. Our jams are always free, open to the public, and kid friendly. For more information you can keep up with the jams on our face book page, through the button below. NO spectators. All attendees must participate. Wear shorts and sports/crop top. Heels optional. Kneepads or long socks/leggings are suggested. Please, no lotion/oils or jewelry. You will learn hand placements, techniques, moves, and trick combinations. All while finding fluid transitions of movement and keeping control of your force around a spinning pole. Class ends with a mini-choreo piece, sequence, or combo challenge.